The PADI Advanced Open Water Diver is your next step after you complete the entry level Open Water Course. This course is called "Advanced" not because you need to be an experienced diver to sign up but because this course advances certified divers to the next level of PADI training focusing on improving your practical dive skills and introducing you to the Specialties while under the supervision of a PADI Scuba Instructor. Similar to the PADI Open Water certification course the PADI Advanced Open Water Diver is divided in to two parts - the PADI on-line theory and the practical dive sessions. The theory is achieved through the PADI e-learning program which allows you to login to your account online and complete all the theory in your own time - there is no need to spend valuable time in a classroom whilst on vacation! To get started, purchase your eLearning Access Pass by clicking on the e-learning button on the top of our website. 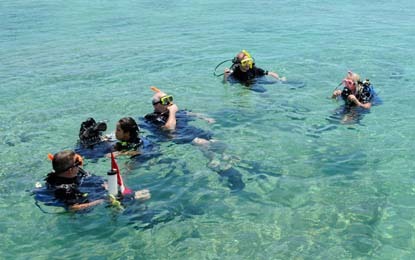 There are two compulsory Adventure dives for this course - Deep Dive and Navigation Dive. The other three Adventure dives to choose from are Wreck, Fish ID, Night, Peak Performance Buoyancy, Multilevel, U/W Videography, U/W Photography, Nitrox, Search and Recovery. We can schedule the PADI Advanced Open Water Diver course in as little as two days or spread over a week depending on what you prefer. We come and collect you from your hotel lobby in the morning and return you back in the late afternoon - everything you will need for the day is provided. All you need to bring along is a towel and swimwear. This course is available to those students who are a minimum of 12 years old, have completed the Open Water Course, medically fit to dive and be comfortable in the water. Please review the PADI Medical Questionnaire prior to enrolling in any PADI training course. If you answer "YES" to any of the medical issues it does not necessarily disqualify you from Scuba Diving - it just means your pre-existing condition could possibly affect your safety while diving and you must seek your Physician's approval to dive.